Researchers at the Masdar Institute have tried to create a technology that would enhance the ability of some plastics to slow down the process of oxidation. Oxidation is the natural phenomenon that results in spoilt foods. The study backs UAE’s position in being a regional leader in the plastic industry worldwide. The research was headed by Dr. Kumar Shanmugam, Masdar Institute Assistant Professor of Mechanical and Materials Engineering, in association with a petrochemical company called Abu Dhabi Polymers Company (Borouge). The company offers advanced, value adding plastic solutions, and is a joint venture between Austria’s Borealis and Abu Dhabi National Oil Company (ADNOC). The plastic produced efficiently provides better safety, transportation and preservation of food. Its transparent form ensures a wide variety of uses and is also aesthetically appealing. With the right combination of nano-materials, dosing levels and process parameters, a significant improvement in oxygen barrier performance can be achieved. Therefore, this study is a step toward the development of a commercially viable solution. “Partnering with regional industry leaders like Borouge to address their technology challenges is critically important to Masdar Institute’s mission of positioning Abu Dhabi as a knowledge hub and engine for socio-economic growth,” said Dr. Steve Griffiths, Vice President for Research, Masdar Institute. The study led by Dr. Kumar has improved the ability of the polymer used for packing to prevent the diffusion of oxygen. The seepage of oxygen into sealed containers, which leads to spoilage of food, is prevented. The resulting plastic ensures the development of high-quality containers that can maintain the freshness of the food for longer periods of time. The polypropylene resins and polyethylene were provided by Borogue, and the blending materials are designed in Masdar Institute’s labs. The permeation exams that are done to evaluate the oxygen barrier resistance were conducted in Borouge’s facilities. We developed different nano-composite blends for polymers made out of three different materials – silicate nano-clays, carbon nanotubes and graphene. Graphene, carbon nanotubes and silicate nano-clays together form a barrier for oxygen, preventing oxygen diffusion. If such special barriers are not in place, oxygen would seep directly through the plastic. This solution ensures that the path of oxygen is blocked, making the diffusion difficult and as such, reduces the level of oxygen that seeps through the plastic. A paper on the, now completed study has been presented in the journal Carbon and has been co-authored by Dr. Kumar, Masdar Institute’s Post-Doctoral Research Fellow Dr. Yanbin Cui, and Dr. Shailesh Kundalwal, Banting Post-doctoral Fellow, University of Toronto. “Each material increased the plastic’s barrier performance, with nanoclay reducing oxygen diffusion by 15%, graphene by 25%, and carbon nanotubes by 40%,” Dr. Kumar added. The coating increases the longevity of the plastic by preventing the plastic layers from breaking apart, in addition to preventing the diffusion of oxygen that leads to food getting spoilt. The nano-coating would aid in the manufacturing of long-lasting containers. This would result in the decrease of the number of containers that are thrown away. The coating can create both environmental and financial savings. 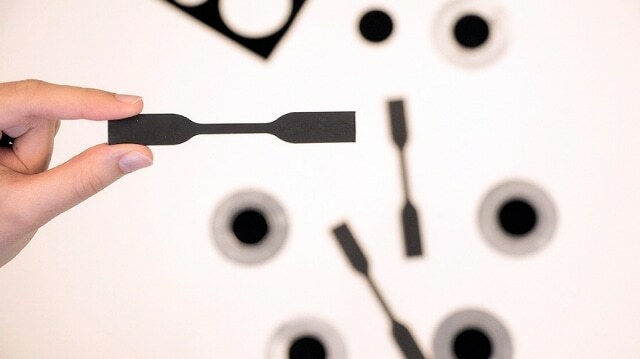 The use of carbon nanotubes and graphene provided high levels of barrier, and simultaneously made the plastic less dark and more transparent. Nanoparticles offer dual benefits of increased barrier performance and transparency. Polymers created by carbon nanotube and graphene could be used in other applications where there is no need for transparency and oxygen diffusion is undesirable, believes Dr. Kumar. Some applications can be gas and oil pipelines and underground pipes. The research conducted by Masdar Institute with the aim to improve the quality of plastic produced by regional petrochemical producers like Borouge are meant to provide the country with a competitive advantage in the plastic market.